I am expanding on a theme here. 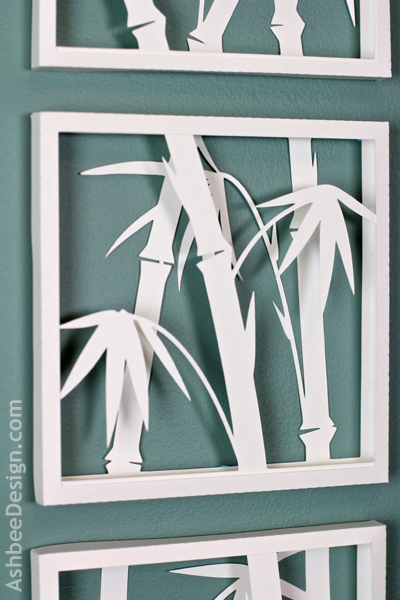 I so loved the birch tree paper shadow boxes last week, and they were so easy to make. I decided to use the same technique with a different topic. 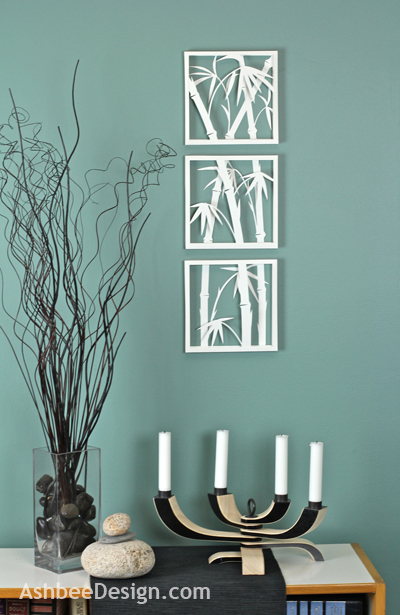 I especially love Chinese Brush Painting and the elegant compositions of simplified bamboo created using that technique. I decided to work with that theme for my second shadow box series. 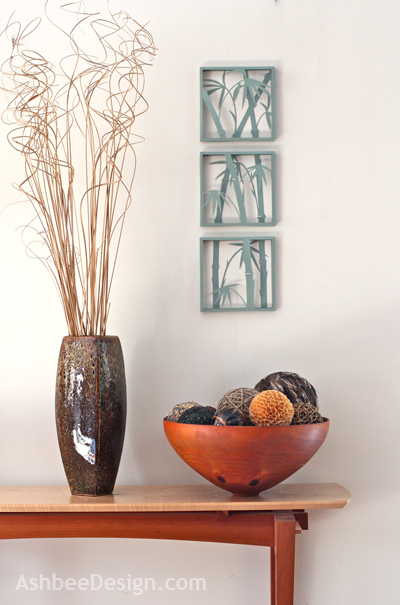 I created stylized shapes to represent the stalks and leaves of the bamboo plant and then combined them into an arrangement on two levels. I especially like how the composition leaves one square and then enters the next. 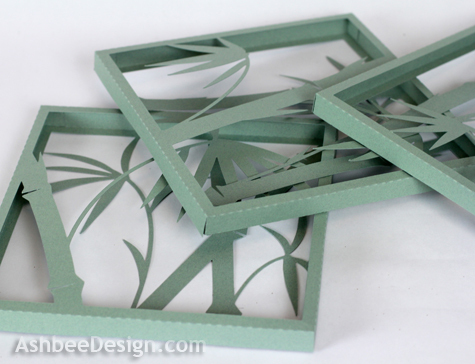 Each of the squares is created from two paper boxes cut using my Silhouette and slid together. Using the Silhouette allows me to easily create duplicates but it isn't required. 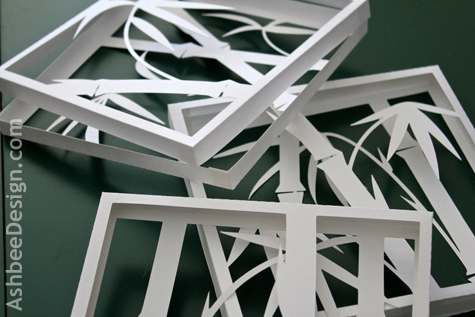 These shapes are fairly simple and could be cut using and x-acto blade as well. 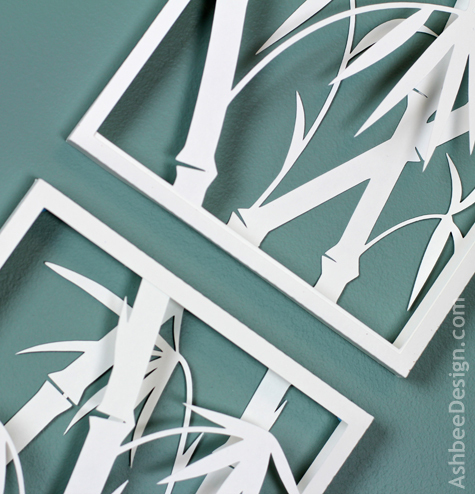 I used the Silhouette templates I create to make two sets, one in white and one in sage green. I am not sure which I like best. Do you have an opinion? And then, as has become my habit, I have fun taking pictures just for the compositions. Bamboo is not my last idea for this techique. I have more coming! These are lovely. The white against the teal wall is my favorite. I've also enjoyed your previous Silhouette projects. It's amazing how fast you caught on to using the Silhouette! The links you sent me awhile back certainly helped! Thank you! I am only using a small portion of the machine's capability but I have a lot of ideas. Just not enough time. I expect that is a problem I share with many! LOL--There is never enough time! Love it! 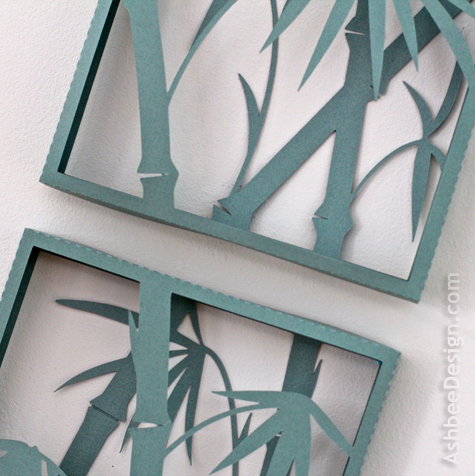 My favorite is the white shadow boxes on your blue/gray wall. Beautiful! I like the white best as well. I started with white because I have a big package of index card stock. Each time I try to use a color I am disappointed. Interesting. These are so gorgeous, Marji. I love the birch too- you are amazingly talented! Hi Bettsi, Thanks for stopping by and commenting. I always look for your input. I am continuing to expand to new themes with this technique. Apple blossoms on a branch is next! Wow! What beautiful creations. I recently got a Silhouette Cameo for Christmas and have been exploring a few simple projects, but nothing to this level. Definitely pinning and adding it to my Silhouette board. Brava! Thanks Lauren for visiting and commenting. I've had my Silhouette since November and I started out slowly with much easier projects but then I just kept going. I love the tool! Holy cow! I can't believe you made all of these with your silhouette, they look awesome! Really great job. Thanks Taryn, I am loving my Silhouette and am amazed with what I can do. I am exploring new areas that are expanding the tool. So much of what is done is text based. That isn't my strength. Beautiful.. I am a new Cameo user, would love to be able to create something like this.. It took me a few months and some simpler projects to get going. Give it some time and practice and you will be able to create as well. Thanks for stopping by and visiting. How fun and unique. Great technique here. I like them both but, I think the white really pops on the darker painted wall. Thank you for showing this at TTF! Visiting from Sweet Sharing Monday linkup. Love this idea. Following you now by Linky. Welcome Julie, More shadow boxes to come so stay tuned. I can see I haven't explored my silhouette enough. These are amazing! Thank you for linking up to What We Accomplished Wednesdays! Have a great weekend! I've been inspired to expand the 3-D options for the silhouette. It is too stuck in lettering and has such a greater potential. Wow - looks so lovely!! Thanks for sharing this at Romance on a dime! !